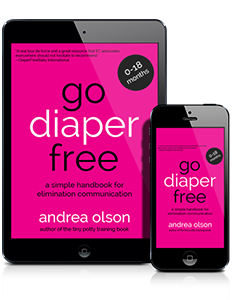 Today's episode of the Go Diaper Free Podcast is all about baby signals. How will you recognize when your baby needs to potty? And, how can you teach them to signal? Baby signals can differ depending on the developmental stage of your baby, so today we'll cover some of the common signals you will see for various ages and how you can recognize them. The easiest time to start Elimination Communication is when your baby is a newborn because they tend to be especially vocal with their signals, but EC can be implemented at a later stage and we'll also talk cues for the older baby. We'll go over what pottying would have been like centuries ago, and how you can let that information guide you through your EC journey. 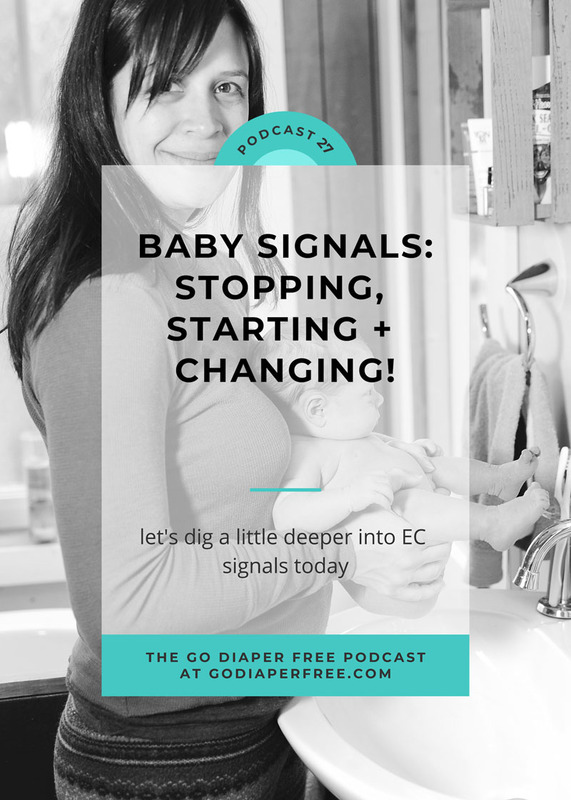 Transcript: BABY SIGNALS: STOPPING, STARTING + CHANGING! Your turn! Please leave a comment below with your baby’s current signal. Great episode, Andrea. I really appreciate this clear and concise format as it is easy to fit in to a busy day! Great episode! Thanks for all of the useful information. My baby is 4.5 months and we’ve been doing EC for around 2 months. She doesn’t really signal when she has to pee, it just comes out. But I know when she has to poo. After waking up, after breastfeeding, usually before we start to put her to sleep. Usually with pees I just guess and try and it usually works. You are so welcome, Kristan!! <3 You gals are doing great! Love this episode! Perfect length. Your info is very helpful for me! I’ve learned a lot from you! My baby girl is 6 1/2 months. So close to crawling! EC is going really well, I’m not sure if she’s signaling a lot right now, but something’s working. We seem to be communicating well! We catch a lot of the pees, and mostly all the poos since starting solids a few short weeks ago. From month 4 to 6, baby would often signal with a “crrrr” sound (especially while breastfeeding and looking straight into my eyes). Now, she’s started scratching her diaper when she needs to go. It’s much more subtle since her little hands are always busy wiggling around! My LO is now 14 months, but we’re still not having great success. Don’t get me wrong I’m super glad when we do catch, but it’s only about 60% of the time. I know we should be looking at wrapping up at this age, but I think I need to do more research on it. She’s also currently getting three teeth!! (Wow) so EC as well as sleeping through the whole night is a bit of a struggle right now along with solid foods and pretty much everything but playing and nursing. BUT when she does tell me she has to go, it’s still grunts for botb. I’m considering moving the potty into our living room as we have a baby gate up as mom works while watching the little and the potty is in her room…. Any thoughts appreciated!! Thanks Andrea. I have found your content helpful during our EC journey!! That must be a lot for you to handle right now! Sometimes teething can really interrupt life:( but 60% of the time is majority so that means you’re getting closer to 100! My daughter grunted for pee and poop until like 20 months. Keep honoring her cues and taking her when she does signals. Try your idea of moving the potty to the room, it may work! Thank you!! That’s good to know. I think I’ll give it a shot! Great episode! Exactly what I needed to hear. My lo is almost 4 months and I’m currently struggling recognizing any signals for pee. She seems to be holding her bladder longer; my timing will be way off with when she actually needs to go. Poop is much easier. She really doesn’t like to have a poopy diaper so she tries harder to let me know and I normally catch 100% of poos. I love hearing about how your EC is going with Twyla. Have you experienced any regression from your other kids following her birth? I am currently trying to bounce back from a regression from my 2 1/2 year old boy. Any tips there appreciated. I am looking forward to more podcasts from you. You have excellent advice and always encourage me to keep at it! Thank you! My boy is almost 4 months. Some times I know certain signals is poppping off the breast when nursing. He’s aslo very predictable in the morning. 7:00 on the dot starts crying and wiggling in his sleep— he just needs to poo. So I potty him then. And he goes back to sleep; it’s been like that since birth. Sometimes he randomly whines or cries during playtime as a cue for pee as well. Starting for birth definitely paid off— his signals were SO clear as a newborn it was amazing. At 6M old, Katherine is crawling and boogying and loves to play. She will get either super still or super squirmy as her main signal. Otherwise we are relying on natural timing (1 hour unless she has recently woken up) and transition times. Hoping she will start crawling better soon and realize she can crawl towards the potty as a cue. Congratulations on your new addition. I love listening to your podcasts and all the fantastic information. I’m always aware of my son looking towards me if he wants a feed and he looks away from me or at the door if he’s wanting the potty. As you talked about in one of the podcasts – he had a potty pause around 6 months and although he’s back to using the potty again – he sometimes doesn’t want to sit down anymore or he’ll sit on the toilet but not the potty. I’m not sure why. Congratulations with your new potty too. Thanks. Thank you for this episode, Andrea. I loved that the format is short and straight to the point. It’s so simple and obvious to look for a uncomfortable sign but I didn’t before listening to this! I was just looking for specific signs and was not looking at the whole picture. This episode made all the difference for us. She’s 3 months old and we started 2 weeks ago. I went from 1 catch a day for 9 catches just after listening to your tips! Thank you!